After 20-some years of being a vegetarian then a pescetarian, I recently ‘broke veg’. It happened a little more than a month ago while Mike was still in California. I was at his house. We’d had a drink or……two……and he was eating something that smelled delicious. I asked what it was and he said something like, “Shrimp wrapped in bacon and smothered in yummy sauce…”…..or something to that effect…. He held one to my mouth and…..after more than 20 years of eating no meat products…..I ate it. Hey, if you’re going to break veg, you might as well do it with bacon, right? I’d been thinking about it anyway….opening my mind to the idea….and this seemed like a good opportunity to take the plunge. Actually, it was a really good opportunity – it was delicious. The reason I’d been thinking about it is this trip to Vietnam. I figured I’d be exposed to a lot of different foods and I didn’t want to restrict myself. I wanted to be open to trying new things. I also didn’t want to find myself being offered food by someone and coming across as rude or ungrateful by refusing to eat it because it had meat in it. It was time for a change……and boy oh boy, have things changed. 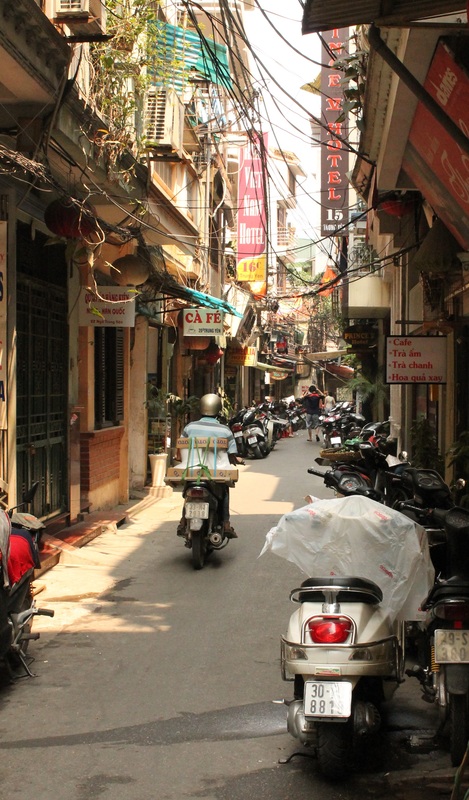 After 4 days in Vietnam, I’ve eaten chicken, fried goat udders, caterpillar larvae, unknown fish substances, unknown pork substances…..I’m pretty sure it was pork, anyway….and other various…..unknown…..substances…. 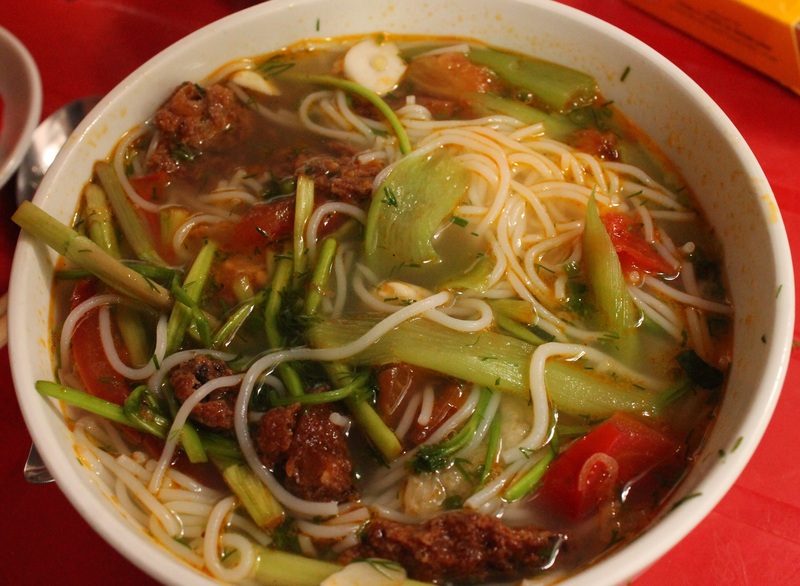 My favorite thing to eat, though, by far, is bùn cá. 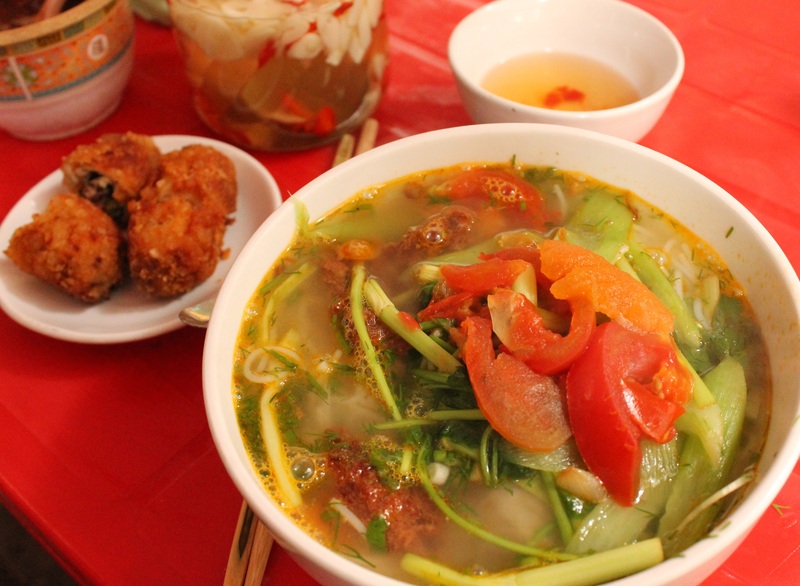 It is a bowl of the most delicious broth (possibly a vegetable based broth – it has a citrusy punch to it) packed full with rice vermicelli, green onions, tomato, fried fish pieces and all sorts of herbs. On the table there are bowls and jars of garlic and hot red pepper sauces and extra herbs you can add to it. Omigosh, if this doesn’t make your nose run, you don’t have sinuses! It is incredibly, unbelievably tasty…..and on the side you can order (what Mike and I call) fried fish balls. I guess it’s just fish pieces and parts rolled in crumbs of some sort and fried. So yummy…..for breakfast, no less……. Bùn cá with ‘fried fish balls’ on the side! Bùn cá all stirred up with pepper sauce & garlic. 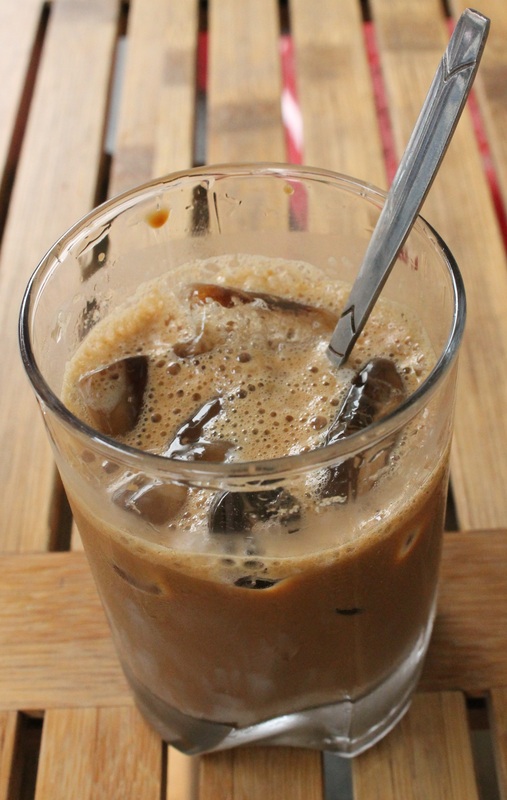 Then….later in the afternoon when it’s got even more hot and humid than it was when you ate breakfast at 7am, you can stop just about anywhere for a cà phê sua dá – iced white coffee. Holy moly, it’s addictive. 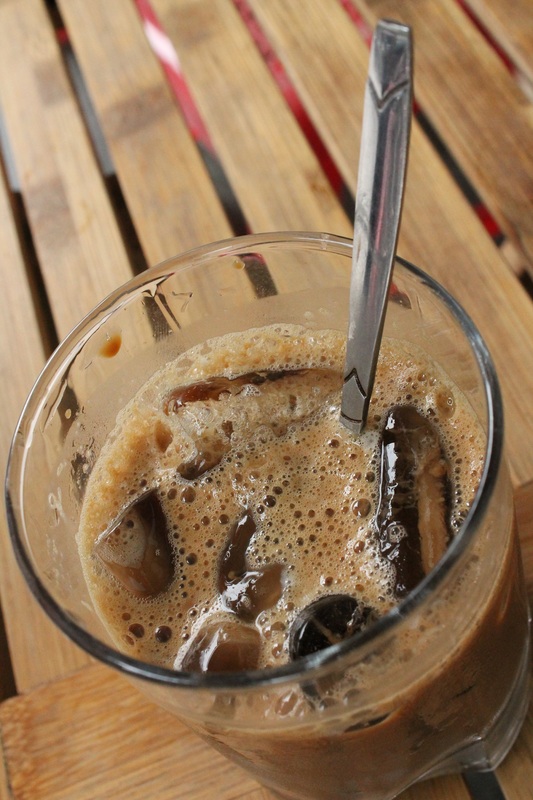 What makes it ‘white’ is the small teaspoon of sweetened condensed milk they put in it. It’s so heavy, it falls to the bottom of your glass so you have to stir it in. Oh my. Yummy. This is the street at which is my hotel. I’ve been having the most wonderful time. Jan! Beautiful pictures! No surprise coming from you 😉 The food looks amazing! I can’t wait to visit and try it for myself. 🙂 I’m so glad you are enjoying yourself, friend. Lots and lots of love. i think youre gonna need a moped. 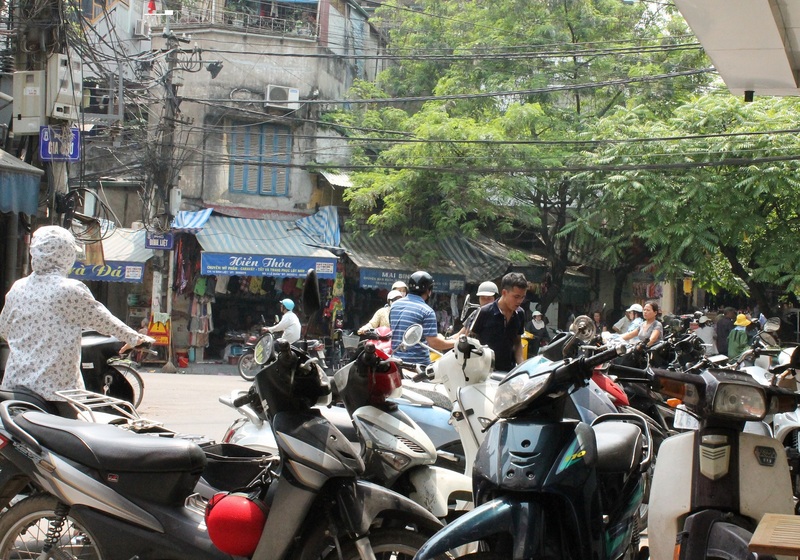 We’ve talked about getting (or at least renting) a motor bike for cruising around the countryside, but I am SO not ready, Sair, for driving around Hanoi. It’s nuts! Great for you! The adventure sounds so exotic and fun. Even I shy away from swine. I love the blog and it looks like you’re really getting the hang of it. Things are great here in exotic Montecito. Been working on PlayFest Santa Barbara, a new play and musical festival here in town and I just sold my screenplay. I have another about the Vietnam war, so I feel I’ve been there, at least, in spirit. Good luck with the adventure and I hope to hear from you soon. Hi Jeff, great to hear from you! Yes, I’m looking forward to settling back in to a more vegetarian diet, but it’s been fun/interesting to explore and try new things. I am so happy for you, selling your screenplay. Keep me posted!